I stopped by a used book store last night becaue... well, it's a used book store! I'm by no means a collector of antique books or anything, but I almost always find something interesting and/or useful in just browsing the stacks. This particular store was unlike any I'd ever been in though. 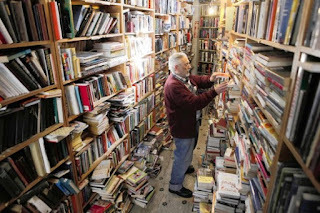 The place was so filled with books that it was physically difficult to navigate the store. (That's an actual picture of it at the right.) Every spare nook and cranny was packed with books and when they ran out of room, they got stacked up on the floor in the aisles. The store was, unsurprisingly, very loosely organized. Old post-it notes that had lost their stickiness and had been stapled back to the bookshelves identified broad categories, but beyond that, it was a crap-shoot. Sociology was next to History, and Psychology was the next aisle over next to Russian Literature. (Not an exaggeration.) Finding anything seems to be a bit of an adventure, and I think that's probably the biggest appeal here. I was surprised to discover he did have a few shelves of comics material, unlabeled and mixed in with the humor. Very little in the way of mainstream type material you might be searching for, but I found a few interesting nuggets. There were a few DC pocketbook paperbacks from 1978 that I never knew existed; at a buck fifty each, I couldn't pass those up. And I stumbled across a 1992 issue of Psychic Chicago -- Chicago's Psychic Magazine. It had an intriguing cover, and a quick flip-through revealed a four-page comic in the middle of it! I also picked up some Kim Deitch, The Making of a Graphic Novel: The Resonator, and a civil liberties anthology that was NOT put out by the CBLDF. Absolutely none of those books I picked were ones I was looking for in any capacity. In fact, I was completely unaware that any of them actually existed at all. I bought them in part because they were cheap, but also because there was some thrill of discovering something totally unexpected in a dark and mysertious place. It kind of had an Indiana Jones element to it, honestly. I could have left the books there -- or, for that matter, thrown them anywhere in the building; they wouldn't seem out of place regardless where/how they landed -- but I paid for them as a sort of trophy. I dove headlong into a labyrinth of dusty books on ancient shelves, and emerged having conquered the minotaur. As much as I love the ease and accessibility and universality of Amazon and eBay and the like, yesterday afternoon was quite the literary adventure, and I quite like the idea of being an Indiana Jones of sequential art.